Small malas or rosaries made from small conch shells or shankh are considered lucky and auspicious in Hinduism. Shankh is an important puja item and is used in Hindu pujas. Conch Rosaries are dear to Goddess Lakshmi. Conch Mala is used usually in the sadhana of Hindu Goddess Lakshmi or while chanting mantras and prayers dedicated to Goddess Laxmi. It is believed that wearing of small conch malas bring peace and prosperity. Some people keep this mala along with account books and in cash lockers for luck and business prosperity. 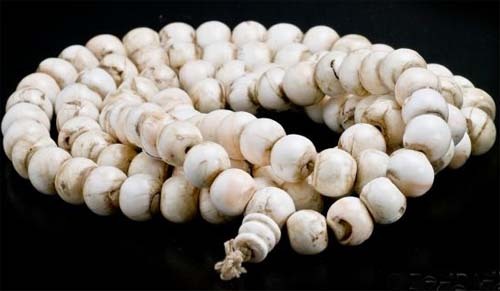 People who constantly give speeches wear the conch shell mala to overcome stage fear and to gain confidence. Some people wear it to overcome speech problems. Some people also make offering of Conch shell mala to Goddess Lakshmi.